Encouraging people to cook at home has been my mission for the last twenty years. 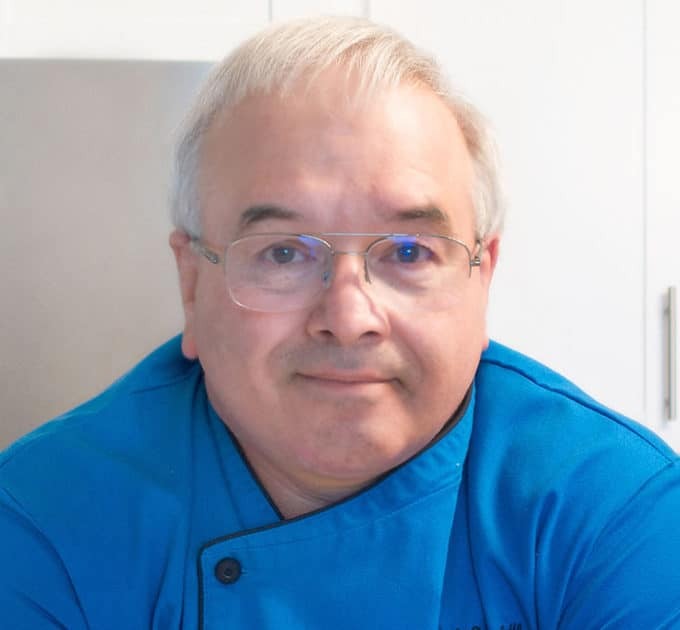 People think that because I’m a chef that they could never do what I do, but with companies like Terra’s Kitchen you can cook like a chef in your own home, easier than you think! 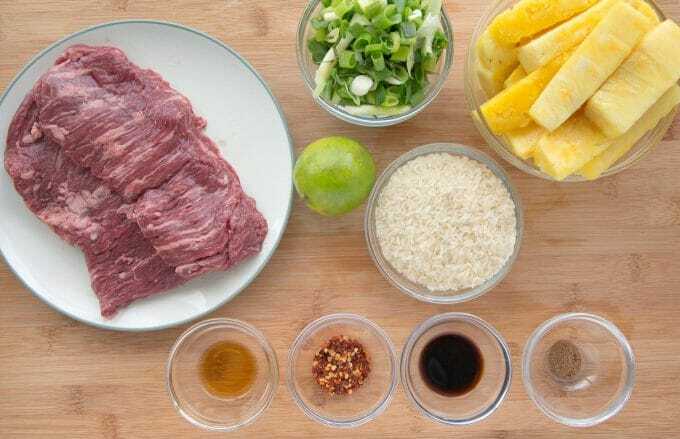 I was recently asked by Terra’s Kitchen to take a look at their Fresh Meal Delivery Service and give my opinion from a Chef’s viewpoint. Although this is a sponsored post all of my opinions are honest and 100% my own. 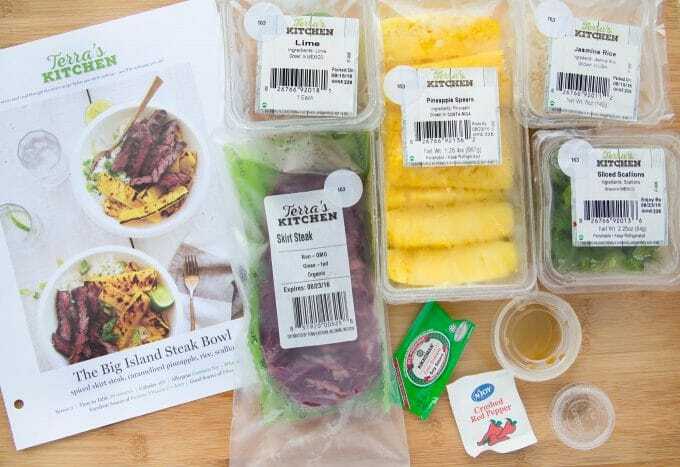 I was always a little skeptical when it came to meal delivery services but after using Terra’s Kitchen and making the dinners from the fresh ingredients they provide, I’m a true believer! 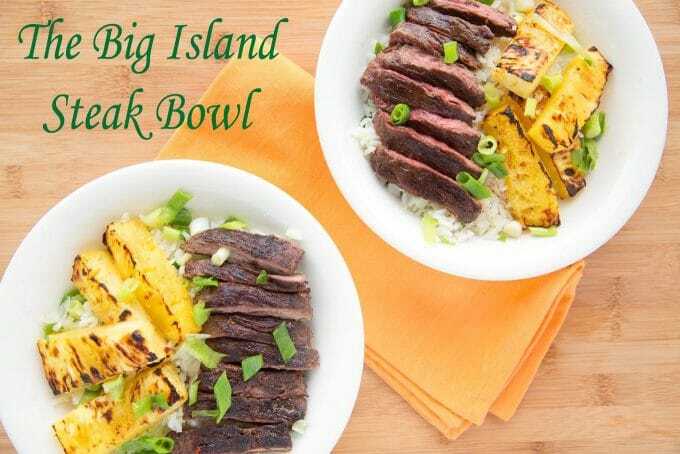 After all, what could be better than a home cooked meal like The Big Island Steak Bowl after a hectic day at work, and if you’d like to give it a try use this code to get $30 off your first order CHEFD30. 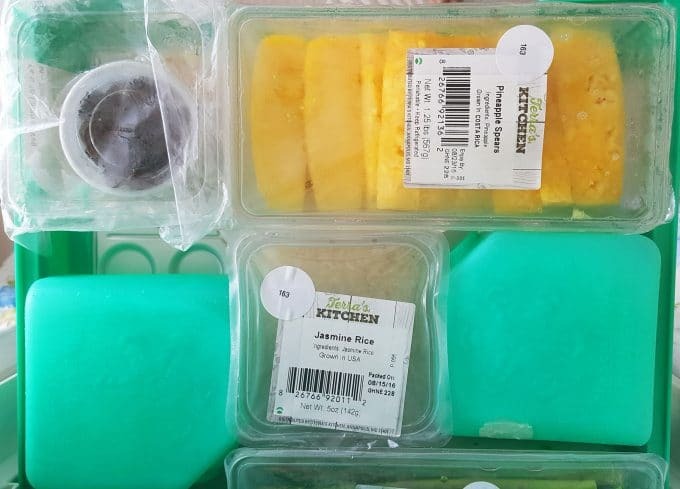 Terra’s Kitchen makes it easy for you to enjoy home cooked meals by delivering your ingredients to your doorstep. 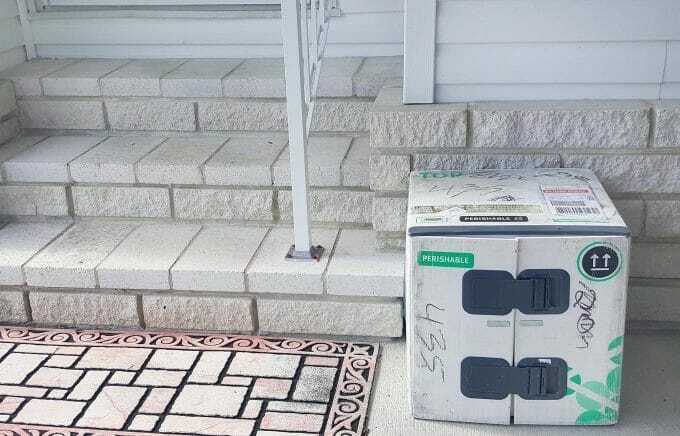 Each week, they send you everything you need in a climate-controlled eco-friendly vessel. 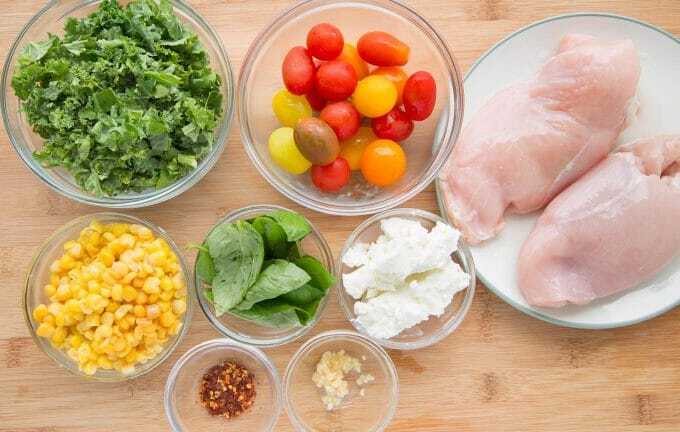 Perfectly ripe and fresh, pre-prepped ingredients and quality pre-portioned proteins that are ready for cooking; and easy-to-follow, step-by-step recipe cards with pictures. The vessel eliminates all the unnecessary waste from shipping and packing. And when you’re done unpacking, just leave it outside for next day pickup. 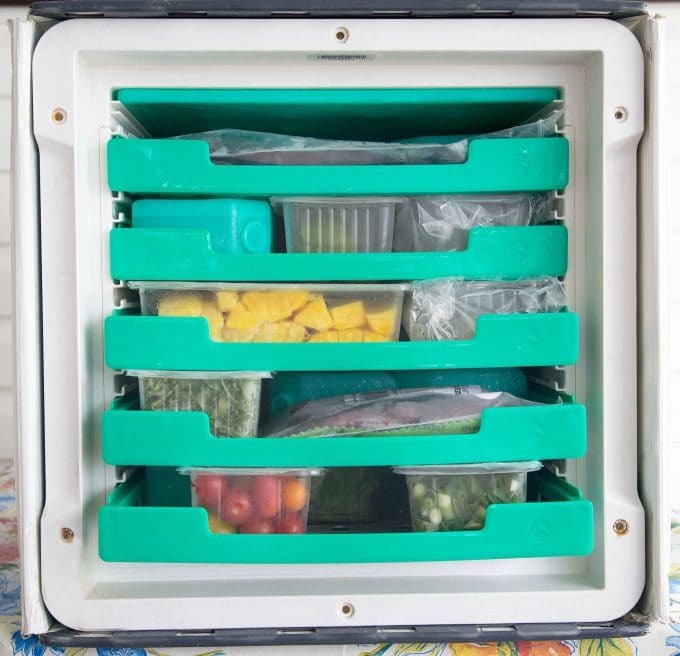 Inside all of your ingredients are pre-portioned in their own containers, making it easy to store and easy to prepare your meals. They’ve hand-picked the most reliable food sources across North America to ensure your vessel always holds high quality and delicious ingredients. Just open the vessel to discover fresh-cut produce, the country’s best proteins, and fantastic tasting sauces. All in durable, climate-controlled, and re-usable shipping vessel that eliminates waste. Inside all the ingredients for each of the dishes you select are in their own containers ready to go. Each Recipe has a colorful easy to follow recipe card that you can save in a binder, making your own cookbook! One thing I do before I cook anything is set my ingredients out so everything is at my fingertips as I need it. In the professional kitchen, we refer to this as a Mise en Place (everything in its place). 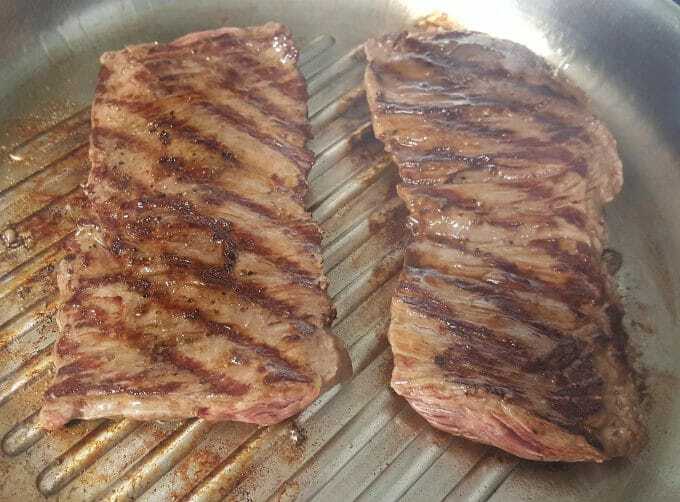 I used my grill pan to cook the flank steak, but feel free to toss it on your barbecue grill. Either way, it will come out delicious and tender! Making an ah-mazingly delicious dinner in your own home has never been so easy. 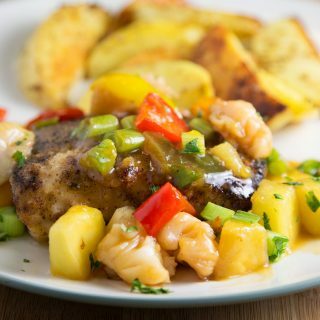 With the shopping and the prep done, you get to enjoy a restaurant style dinner that takes minutes to prepare after your busy day. Healthy recipes in less than 30 minutes, these are Recipes for Real Life. 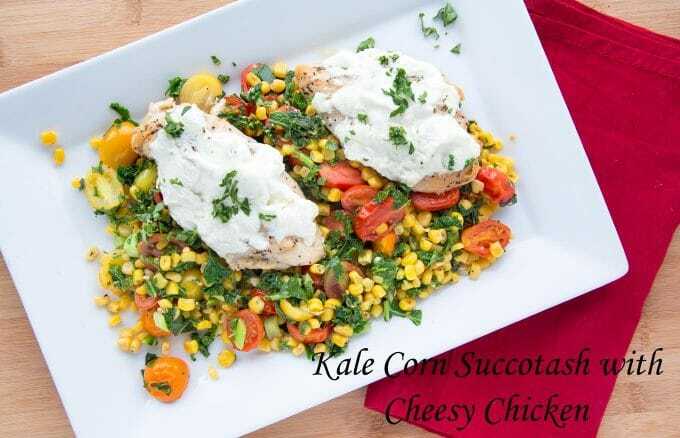 One of the other dinners I made from my Terra’s Kitchen order was Kale Corn Succotash over Cheesy Chicken. 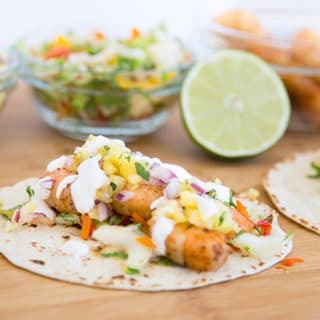 It was just as easy to prepare and just as delicious! 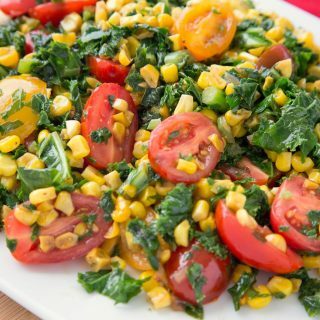 In fact, I’m probably going to steal the idea for the Kale Corn Succotash! 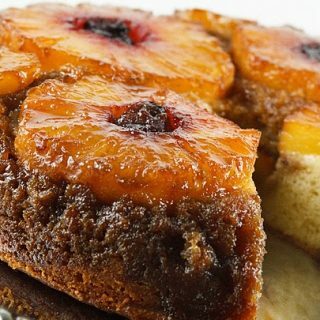 Just to sweeten the deal when you place your first order with Terra’s Kitchen, you’ll get $30 off by using this code- CHEFD30. In a small bowl combine half the soy sauce, half the brown sugar, 1/2 teaspoon salt and 1/2 teaspoon black pepper. Rub mixture over steak and set aside until needed. Zest half the lime and cut in half. In a small saucepan over high heat , bring 1/1/4 cups water and 1/4 teaspoon salt to boil. Stir in rice and return to a boil. Reduce heat to low, cover and simmer for 15 minutes. Turn off heat and let sit, covered for 5 minutes. Fluff with a fork and gently stir in sesame oil, lime zest, juice from half of a lime and all but 1 tablespoon of the scallions. 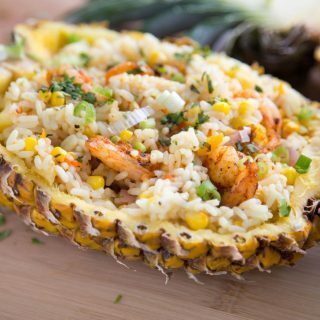 Remove pineapple from oven and sprinkle with the remaining brown sugar and red pepper flakes to taste. Rub a grill pan (or grill outdoors) with 1 teaspoon cooking oil and place over high heat. When the grill pan starts to smoke, add steaks and cook to medium rare (or your preference), turning once. Cook each side 3-4 minutes or as needed to desired temperature. Remove to a plate and allow to rest for 5 minutes. Thinly slice steaks against the grain. Divide rice between two bowls. 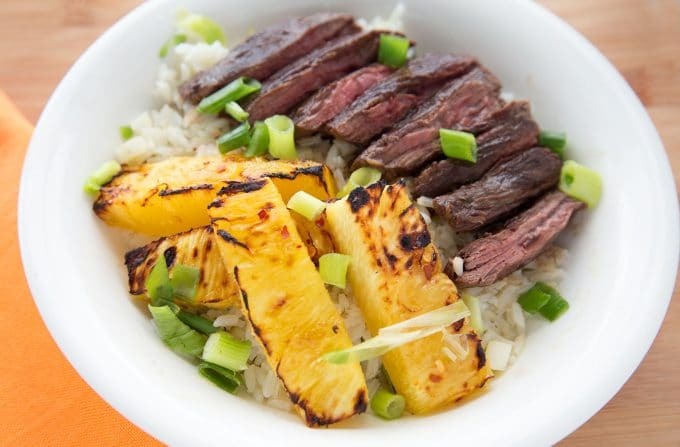 Top with sliced steak and pineapple spears. 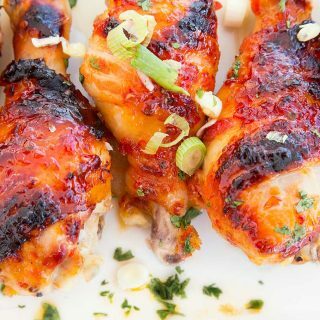 Squeeze remaining lime over ingredients and garnish with scallions and crushed red pepper if you'd like a little more heat. Click on the link to learn more about Terra’s Kitchen. For more deliciousness follow Terra’s Kitchen on Facebook, Instagram , Twitter and Pinterest. That shipping container is amazing – what a pity they didn’t use reusable packaging for the ingredients too, that could be returned with the container! I can have this steak bowl delivered to my house? I will have to check that out. I know, it’s a pretty awesome delivery service for busy people! I love that there is a service like this for busy people to give them a jump start on preparing great meals. What an innovative shipping container too! Thanks Toni, it really is a pretty awesome service for busy professionals!